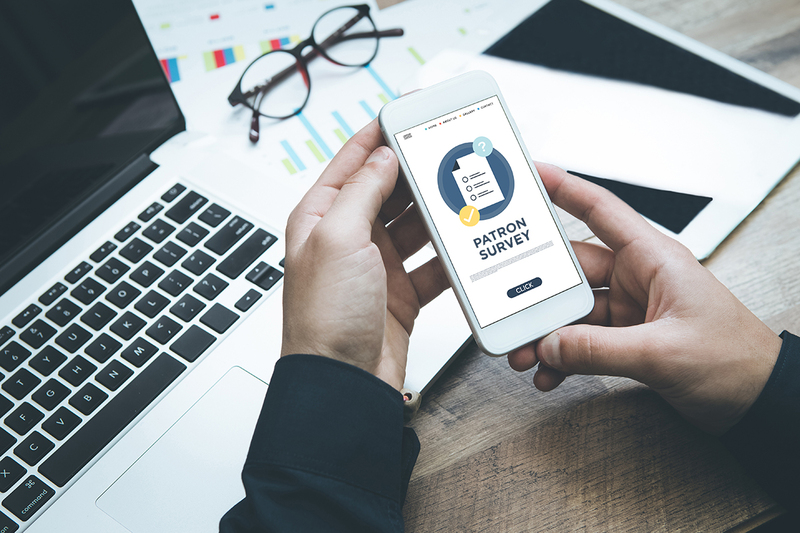 Librarians who visited the Demco Software booth at the 2018 Public Library Association conference answered this question and took it one step further, expanding on the ways their libraries engage and make a positive difference in their communities. Every response gave a unique snapshot of the individual library and community it serves; however, several themes emerged, from community outreach, to programming for seniors, to acting as a safe haven when the community is in need. 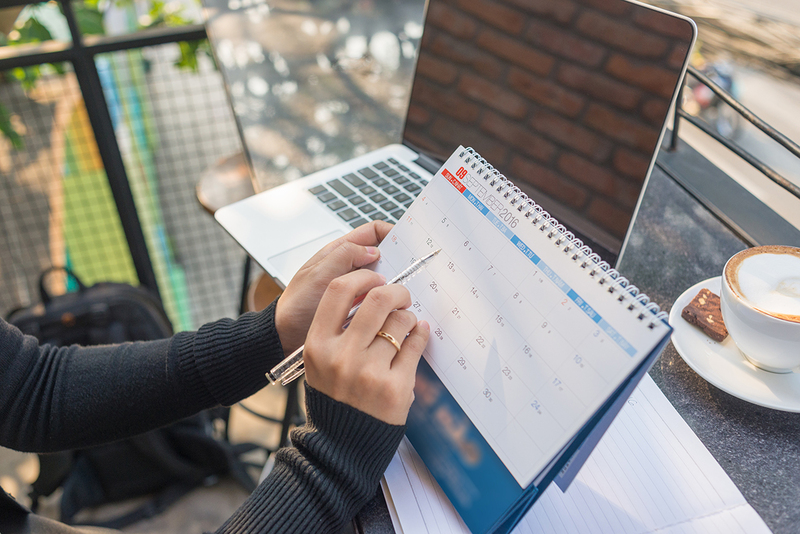 Read on for a sampling of the many ways libraries across the country are connecting with and supporting their communities, and prepare to be inspired! My library serves. 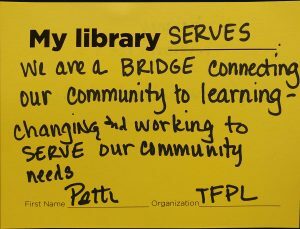 We are a bridge connecting our community to learning — changing and working to serve our community needs. My library makes. [We’re] constructing a makerspace to provide access to maker equipment to the community. My library engages. We provide space and resources to allow patrons to meet, create and explore! My library springboards. We launch people on their desired path of learning and living with our variety of resources: materials, programs, personal connections. My library connects new Marines with the world of libraries. My library teaches GED, literacy and guitar! 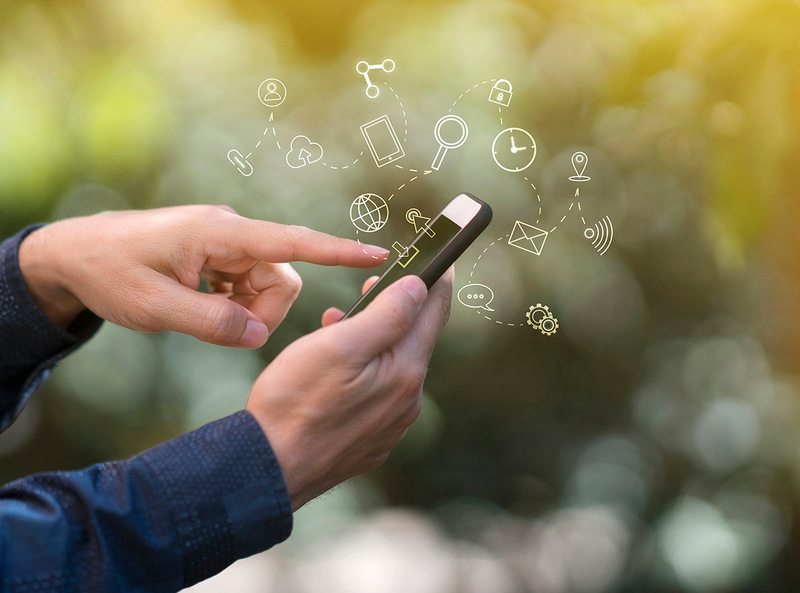 My library offers ease of access with a mobile app. My library tries new things — we started a community garden. My library bikes. We use our book bike for community outreach. It’s loaded with technology so we can showcase it in our community. Our library also just installed a bike fix-it station out front! My library takes suitcases full of materials to locations across the community. My library creates awareness. We visit community events, set up a table, have storytime there and make library cards at the event! My library reaches out. We do outreach at preschools, elementary and middle schools, YMCAs, and Headstarts and share program events with the local family shelter. My library has pop-up libraries at different locations in town, as well as other engaging programs at the library. My library sponsors Stories n’ More at our local park every summer – hundreds attend. My library works with our Council on Aging to bring fabulous authors to our town. My library engages the community with a cookbook group. Patrons borrow a copy, select a recipe and get together to eat and critique. My library educates. We provide ESL classes and citizenship classes. My library cares for seniors. September is Seniors Month, and we have ongoing monthly programs and special events. My library brings in Work One weekly to help with job search and resumes. My library has a certification and training center for the public so that they can get their GED and other certificates for free. My library offers ESOL programs, eBook instructions, homebound visits, book groups for seniors, technology help from our bookmobile staff and reference staff, and puzzles to check out. My library helps by hosting and supporting a weekly Alzheimer’s Support Group. My library collaborates with schools, literacy agencies, health care agencies and early childhood services to lower the rate of kids not ready to learn! My library sparks! By visiting all our schools every week (to support their current projects). My library reaches out to local schools to share programming ideas. My library offers lunch-and-learns for kids over the summer. My library engages local schools by collaborating on an annual community art walk that connects a school, the library, a church and local businesses. My library teaches. Early childhood literacy is very important to us. 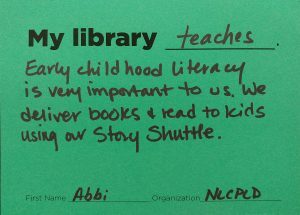 We deliver books and read to kids using our Story Shuttle. My library welcomes. We host school visits, scout groups, local artists to display their work and more! My library partners with a local children’s music class for musical programming! My library rocks! 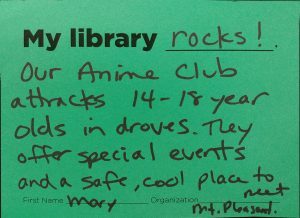 Our Anime Club attracts 14- to 18-year-olds in droves. They offer special events and a safe, cool place to meet. My library loves teens and seniors! We’re teaching them about their family history, connecting them to their roots and to the world. My library provides an after-school space for local teens! My library helps struggling teens get better grades. My library offers space for local schools to host Thespian Induction and National Honor Society Induction programs. We make the connection. My library opens. 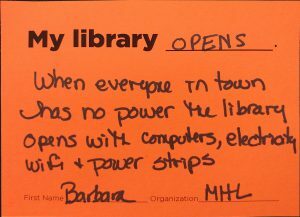 When everyone in town has no power, the library opens with computers, electricity, wifi and power strips. My library engages by providing shelter and social media updates during times of trouble — storms and power outages. My library feeds. We feed youth and homeless! Having community lunches this summer! My library participates in a forum of nonprofit social services agencies in the community. My library provides. We are always developing and implementing programs for the needs we see in our community. 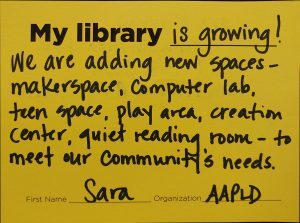 How does your library engage and inspire your community? Share your library’s story with us on Twitter @DemcoSoftware and get more insights on how others focus on community engagement by signing up for our newsletter.